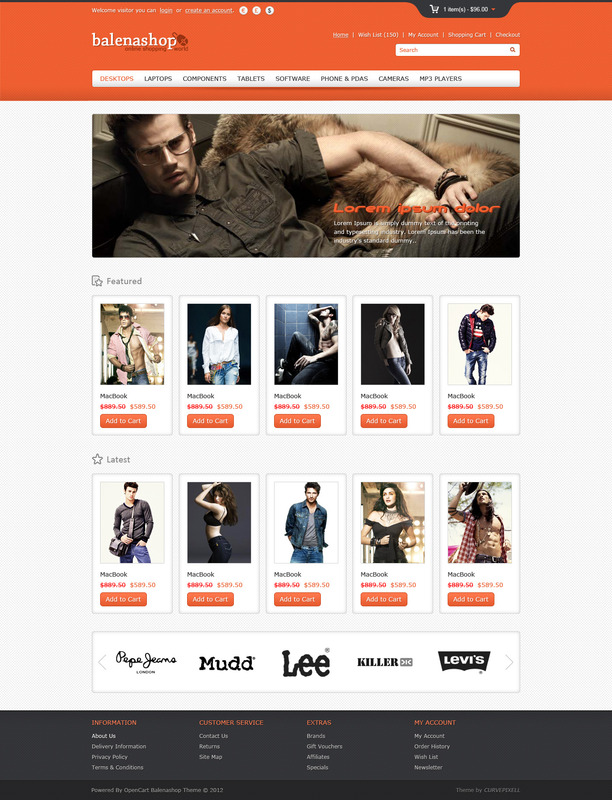 Balenashop is a clean and beautiful responsive HTML 5 opencart theme can be use for any kind of eCommerce shop. Modules like: flex swipe slider, social media module, custom footer, cloud zoom, jackbox responsive lightbox, multiple background patterns, custom jquery functions and effects, sticky footer, iPhone/Mobile animated menu, fully control from admin panel, SEO Friendly. Theme which looks great on desktop, tablets and mobiles. Responsive theme only re-size your browser to check the responsive structure. Latest compatible version 1.5.2.X, 1.5.3.X & 1.5.4.X There’s NO modifications in core files. Responsive flex touch swipe slider. Social media module: Add your social media links manage from admin. New:- Modify custom footer: ( About Us, Twitter Updates, Contact Us & Facebook Likebox ) update the latest version for twitter handler and facebook likebox so user can facing no issue on this. Cloud zoom on product page. New:- Jackbox Responsive Lightbox: Responsive lightbox which support every devices. New:- Added product quantity ”+” ”_” icon for which user can easily add or remove product numbers. Fade in / Fade out effects on hover of featured, latest, product list and product view. Theme which looks great in desktop, tablets, and mobile devices. Including layered 4 colors variations psd files: Incase you need some modification. Theme options on catalog folder. Made with HTML 5 and CSS 3 effects. Well documented for installation and about images sizes. Provided demo store admin url & user details, For setting your store as Balenashop opencart theme please go through ( Extensions >> Modules ) and set everything same as mention. Don’t forget to update your theme! Download the .zip package from your themeforest account and replace the old files with the new ones provided. Version 3.1 – 27th June 2013. Modify custom footer: ( About Us, Twitter Updates, Contact Us & Facebook Likebox )  update the latest version for twitter handler and facebook likebox so user can facing no issue on this. Added product quantity "+"   "-"  icon  for which user can easily add or remove product numbers. Version 3.0 – 29th Apr 2013. Jackbox Responsive Lightbox: Responsive lightbox which support every devices. Update custom footer Tweeter & Facebook showing issue resolved. Some css modification for good look & fell. Version 2.0 – 4th Jan 2013. Issue resolved for edit product from admin. Custom footer ( About us, facebook, contact and twitter column ). No issue related to product tag id using Opencart version 1.5.4.1. Some css modification for better look and also added some icons. Version 1.2 – 26th Oct 2012. With new colors variations including layered psd files. User friendly folder structure for theme upload, psd files and help section. Version 1.0 – 22nd Aug 2012. * Images used in preview are not included in theme only for demo purpose.